The first Masonic funeral in California took place in 1849 before there was a Grand Lodge here, and before California was even admitted into the Union. During the California Gold Rush, the body of a heavily tattooed man was discovered floating in San Francisco Bay. 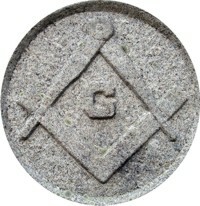 Upon examination, he was found to be carrying the silver shekel of a Mark Master Mason bearing his initials. His tattoos were Masonic in nature; on his left arm he bore the symbols of the Entered Apprentice degree, on his right he bore the symbols of a Fellowcraft, and over his heart were the symbols of a Master Mason. The man’s name remains unknown, but a large gathering of Masons attended his Masonic Funeral.